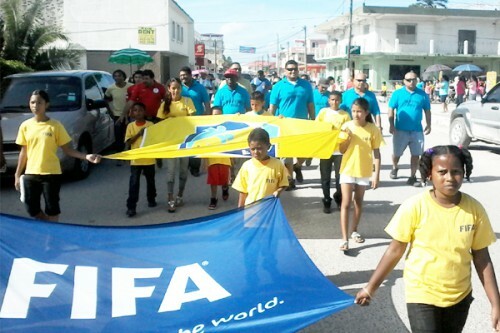 On Saturday, February 22, the official opening and parade of the Mayor’s U-10 Football Tournament 2014 was a huge success, with 12 participating schools. This was followed by the first 2 games of the tournament at the Corozal Civic Center grounds, where Corozal Methodist won, 1-0, over St. Francis Xavier; and Calcutta Gov’t defeated San Antonio Gov’t, 3-1. The upcoming weekend games will be at the Corozal Civic Center grounds. The Corozal District primary school male softball Finals will be completed on Wednesday, February 26, at the Civic Center grounds between the boys of Corozal Methodist and Xaibe RC. The Corozal Methodist female softball team are already the District Champions. The Family Fun Run 2014 is scheduled for 9th March, commencing at the Andres Campos Civic Center starting at 9:00 a.m. and finishing at Miami Beach with fun activities such as watermelon eating contest, 3 legged race, lime and spoon, parent and child beach cruiser race, limbo dancing and much more. Your entire family is invited.